The Aberdeen goalkeeper has said that he feels success is just around the corner for Craig Brown's men. 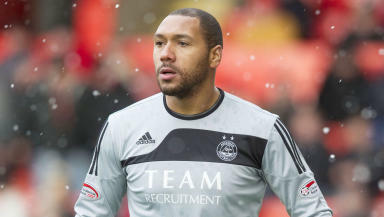 Aberdeen goalkeeper Jason Brown admits that he very nearly gave up football a year ago, but life at Pittodrie has reignited his passion for the game. Brown has played 12 games since taking the first-choice goalkeeper spot from David Gonzalez in December, and has only tasted defeat twice during those matches. It is a remarkable turnaround for the Welsh international, who managed just 12 games and intermittent loan spells during his time at Blackburn. The goalkeeper told Red TV: "I'm loving it here. I fell back in love with football. "This time last year, if I'm being perfectly honest, I would have walked away from the game. I just felt I wasn't getting the rub of the green. You feel the whole world is against you. "But I love it here and my family love it here. A lot of people think my contract is up in the summer but I have another year and I'm hoping to stay many years after that." Brown also believes that Aberdeen can build on their recent improvements and continue to build. He added: "I want success and I genuinely believe we can get it here, 100% hand on heart, and I want to be part of that." "I think we can do some exciting things next season. You have to take into consideration that this is a new squad. "A lot of people have looked past that and said 'this is not good enough'. But you have to take that into consideration." The goalkeeper still has ambitions for the remainder of this season, and would like to maintain the Dons' position in the top six by defeating Hibernian at Easter Road on Saturday. The 29-year-old said: "Up until fifth they have a nice cushion. We are six points behind but we play them as well. "We play teams in and around us so we can take points to consolidate top six. But going to Hibs will be very tough. They have brought in a lot of players from England and they are fighting for their lives. "So we have to go with the same attitude as we have been doing and stay in the game because they will come out flying being the home team."